In an era of fiscal constraints, counties are developing innovative solutions to serve their residents. The National Association of Counties (NACo) and the National Council of County Association Executives (NCCAE) are key partners in helping counties meet these challenges. In August 2017, the NACo Counties Futures Lab hosted the 2017 NACo-NCCAE Knowledge Management Forum to discuss top county issues with executive directors and staff of 17 state associations of counties. Participants shared their insights into the issues counties in their states are facing and exchanged commonalities and solutions. Subject experts led three educational sessions on major county issues during the Forum: (1) Service Sharing in an Environment of Fiscal Constraints; (2) Rural Deployment of Broadband; and (3) Managing a Retiring County Workforce. Twenty-nine (29) state association executive directors and staff members from 17 different states met in Washington, D.C. for the 2017 NACo-NCCAE Knowledge Management Forum. Declining county funding was the most prevalent issue across the state associations of counties participating in the event. From preemption efforts to diminishing state funding for counties, participants discussed the challenges and impacts of revenue loss on counties. For example, in North Dakota, the state used to provide approximately $3 billion to counties for transportation funding in past years; however, that amount has since fallen to zero. West Virginia counties have been steadily losing revenue due to the state’s declining coal industry. Many California counties are dealing with decreased property and sales tax revenues that have not fully recovered from the latest economic recession, and Pennsylvania counties are concerned about their funding from the state as the legislature plans its budget. In Delaware, the legislature is reconsidering the property transfer tax, which is a large concern for counties since Delaware has no sales tax. The problem of decreasing revenues is further compounded by state governments limiting counties’ abilities to raise revenue. Forty-five (45) states – including all those represented at the Forum – place some limitation on county property tax authority.1 The state of Iowa is further limiting county authority by emphasizing preemption this year. The impact of county revenue losses can be seen explicitly in Washington state, where 75 percent of counties’ general revenues go toward public safety. Recent decreases in property tax and other revenues have forced some Washington counties to cut public safety funding, resulting in some counties not even having 24/7 police coverage. Loss of revenue affects everyone. Counties across the country provide residents with essential services that rely on revenue from not just counties, but states and the federal government, too. For more information, and for individual state profiles on county funding sources, state caps, challenges and solutions please visit www.NACo.org/StateLimits. While many states are decreasing funding streams to counties or capping county own revenue, states are also introducing more mandates for counties. Virginia counties are fighting against a state bill asking for additional transparency requirements in county governments – namely, that every subdivision of local government post every transaction online – but without providing funding for implementation. This bill would lead to a significant workload and financial burden for county governments. In North Dakota, most social services that counties provide are mandated by the state or federal government, but counties do not receive state funding for these services. California counties are facing a potential mandate that would require counties to lease out space on poles for small cell facilities for increased wireless coverage. The lease fees, however, are much lower than the maintenance costs. Wisconsin counties are facing a similar issue with small cell facilities. Finally, in Minnesota, the state has been trying to push human services cost-sharing on counties and thereby increase county human services expenditures. Increasing state mandates not matched by additional state funding augment the financial pressure that counties already feel from decreasing revenues. Counties around the country are seeking innovative ways to manage their county jails as financial and social costs rise with rapidly increasing jail populations. In Alabama, counties are dealing with the rising costs of county jails, as well as a lack of local juvenile justice programs and state funding for them. Georgia counties are working hard to reduce recidivism in their jail system. In West Virginia, counties pay for anyone processed through a magistrate court, no matter the arresting jurisdiction, and the number of inmates has been rapidly rising in West Virginia county jails. In Washington state, there are nine county jails operating over capacity. At the same time, by state law, the medium-sized and large counties in this state have to continue to invest and maintain juvenile detention halls, even if these detention halls are largely empty. A common issue for counties across states is challenges with behavioral health in their criminal justice system, as explained by the Idaho association, whose state has nine recovery and four crisis centers across the state. Counties are key players in America’s justice system, constantly working to protect and improve the lives of their residents. Counties play a crucial role in running elections throughout the United States, an operation that comes with challenges for counties. In Montana, counties are facing a number of elections-related challenges. The Montana Secretary of State has declared fraudulent mail ballots that are not counted, irrespective of the reason behind the lack of counting of a specific ballot. Forcing counties to count every ballot would create additional and unneeded fiscal stress. Furthermore, Montana counties do not have the funding to purchase new voting equipment, nor can they find companies to service their older voting systems. Finding elections judges is also becoming increasingly difficult in Montana. In Washington, counties transitioned successfully to all mail ballots, but only through a long process that took significant amounts of planning. California counties have considered a possible transition to all mail ballots but faced opposition from a few groups, including disability rights groups who believe that some people may take advantage of the disabled and cast fraudulent ballots for them. Finally, Arizona counties are losing funding for elections from the state, and so have tried to switch to all mail ballots – a measure that failed largely due to concerns of voter fraud. Funding upgrades to elections systems, concerns of voter fraud and finding ways to save money while still providing timely and accurate results are among the many elections-related challenges that affect counties across the country. Counties ensure the health and safety of their communities. Confronting public health crises, like the opioid crisis, is an important part of this work. West Virginia counties have been hit especially hard by the opioid crisis, and the state association sees its growth partly fueled by the decline of the state’s coal industry. The opioid crisis is not limited to Appalachia, for the state associations from Washington, Wisconsin and North Carolina all cited the opioid epidemic as one of their largest challenges. Counties ensure the health and safety of their communities. Confronting public health crises, like the opioid crisis, is an important part of this work. To learn more about the opioid crisis and how county leaders can better respond to it, please visit www.opioidaction.org. Service sharing occurs when two or more local government entities cooperate to provide a single service or set of services to residents, and it can take many different shapes and forms. This session explored how a successful shared services model can bring innovation, cost savings and, ultimately, service improvement to all partners involved. The speakers shared their experiences from their time with the federal government and the New York City Metropolitan Transportation Authority (MTA) and led a discussion on the topic with the state associations of counties. Counties can transition to a shared services model more smoothly by planning ahead. Before engaging in service sharing, counties should develop a strong guiding team, identify the strengths of each partner involved and use pilot projects to test the initiative. Service sharing is about sharing the responsibility of providing a service to residents, not about centralization. Make sure all partners understand their responsibilities, and clearly document them ahead of time. Service sharing initiatives should be fluid and adaptable as partners figure out ways to improve the model. Create a culture focused on quality, transparency and customer service that is willing to change when necessary to achieve these goals. Instead of struggling to keep old software running because of capital constraints, move to a model that recognizes software as a shared service and includes continuous upgrades and improvements. Rural broadband continues to be a hot topic for all states. In 2015, rural broadband supported $24.1 billion of U.S. economic activity, as well as nearly 70 thousand jobs.2 Commerce, education, health care and public utilities are among the many sectors that benefit from expanded rural broadband access. To achieve these benefits, counties can partner with local telecommunications providers and explore the possibilities for bringing broadband to their rural communities. 1. Rural broadband drives economic development. Rural communities that had relatively high access to broadband in 2000 saw faster wage and job growth in the following years, as compared to other rural areas.3 Broadband is essential for rural regions to appeal more to both potential businesses and residents. 2. Take a community inventory. Rural regions vary greatly across the U.S. By taking an inventory of their resources and market potential, counties can encourage telecommunications companies to expand broadband access into their regions. This inventory will also allow counties to assess the full impact of broadband deployment. 3. Rural broadband is also an urban issue. Rural and urban regions are dependent on each other. Rural broadband allows individuals and businesses to cross the urban-rural border, which creates mutual benefits and opens opportunities. County governments, like all employers, are dealing with a large retiring workforce.4 Replacing the acquired expertise of these valuable employees is time consuming and costly, but employers can minimize the cost by developing systems for transferring knowledge from one generation to the next. Managers must engage in workforce planning to determine what skills will be needed in the future and if these skills are, and will be, available locally. County governments should consider how to retain the skills of best performing potential retirees. 1. Create a culture of knowledge sharing. Establish groups comprised of both younger and older employees to solve operational issues together and gather feedback on employees’ work experiences. By engaging employees and making them feel comfortable sharing knowledge and critiques, counties can improve their processes, retain the institutional knowledge of potential retirees within the county and recognize the value of this knowledge. 2. Keep older employees engaged in the county workforce. Older workers have years’ worth of knowledge that too often leaves the county when they retire. Before retirements occur, counties can retain the proven talent of older employees by offering the time to develop proposals for performance improvement, adopting a deferred retirement option plan or giving them formal roles as mentors or coaches for younger employees. Counties can also engage retirees by allowing them to return to work part-time after retirement or by establishing a group of skilled retirees for use as consultants. 3. Recognize employees as assets, not costs. Counties that recognize the value of their employees and focus on using their abilities to the fullest can expect to raise performance levels. Counties can make employees feel valued by recognizing and rewarding accomplishments, developing an employee wellness program and adopting a review process that highlights and reduces possible bias. Counties across the country are facing a wide range of challenges as they seek to continue providing their residents with high-quality services in the midst of financial difficulty. 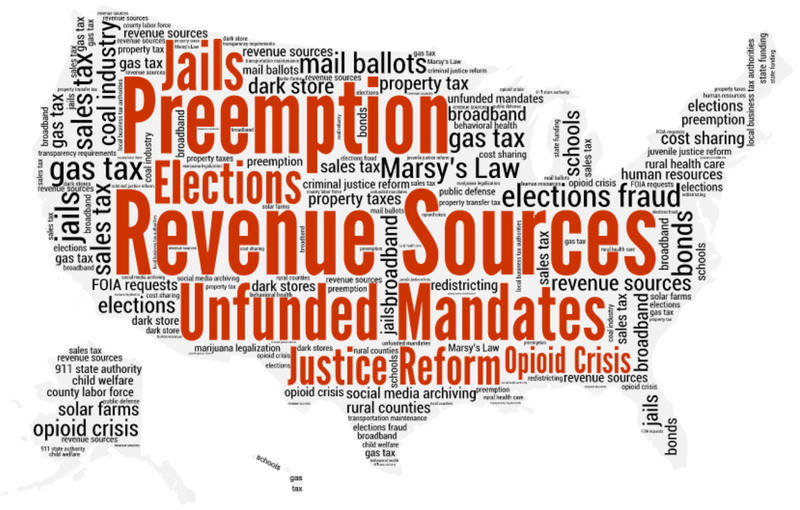 Increased restrictions on counties’ abilities to raise revenue, alongside an increased burden of mandates and decreased state and federal funding are some of the major challenges facing counties. State associations of counties are indispensable partners that work with counties to develop innovative solutions to complex problems. Continued cooperation between NACo, NCCAE and the counties they represent is crucial to enable the growth of thriving communities across the nation. Joel Griffith, Jonathan Harris and Emilia Istrate, ”Doing More with Less: State Revenue Limitations and Mandates on County Finances”, National Association of Counties, NACo Policy Research Paper Series, Issue 5, November 2016. Hanns Kuttner, “The Economic Impact of Broadband,” Hudson Institute, April 2016. Peter Stenberg, Mitch Morehart, Stephen Vogel, John Cromartie, Vince Breneman and Dennis Brown, “Broadband’s Effect on the Rural Economy,” Broadband Internet’s Value for Rural America, U.S. Department of Agriculture’s Economic Research Service, August 2009. Andrew Hartsig, “Managing County Workers: Recruitment, Retention and Retirement,” National Association of Counties, July 2017. The author would like to thank Dan Chenok, Jesse Samberg, Joshua Seidemann and Howard Risher for their presentations during the Forum that form the basis of much of this report. The author would also like to thank the following participants in the Forum for making the event a success: Lucas Beenken, L. Harold Blattie, Katie Boyle, Kelli Brassfield, Eric Bryson, Richard Cecil, Chase Cobb, Chelsea Fibert, Robin Harlow, Eric Johnson, Joe Lerch, Jennifer Marson, Chris McDonald, Linda Millsaps, Geoffrey Neill, Michele NeSmith, Mark O'Connell, Vivian Parsons, William Peterson, Jennifer Piercy, Donnell Preskey Hushka, Hayden Rigo, Lisa Schaefer, Shantil Siaperas, Craig Sullivan, Jill Suurmeyer, Axel Swanson, Bob Wilcox and Paige Worsham. Within the National Association of Counties, the author would like to thank Emilia Istrate, Christina Iskandar and Andrew Hartsig for their helpful comments and contributions. A big thank you goes to Kelsey Wilson for her work in helping with this report. The author also expresses his appreciation to his Public Affairs colleagues for the graphic design and the website versions of the report.